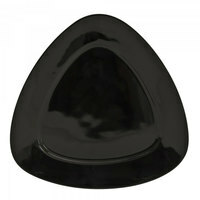 Swap out ordinary round plates for this 10 Strawberry Street black triangle porcelain dinnerware. These triangular plates are available in multiple sizes, so you can find options for serving appetizers, entrees, and desserts. Each plate in this line is even dishwasher safe, which will save on cleanup time for you and your staff. Another feature of this dinnerware is that the plates have wide rim edges that look great and ensure there’s enough room for your delicious food. Add 10 Strawberry Street black triangle dinnerware to your table settings for a unique twist on traditional round plates. You can use this dinnerware to serve a variety of menu items, from sandwiches and chips at lunchtime to meat and vegetables for dinner. Best of all, these plates are dishwasher safe, so you and your staff can spend less valuable time on cleanup. For more dinnerware options, check out our china serving bowls, Homer Laughlin fiesta dinnerware, and Cardinal Caracter white porcelain dinnerware. If you're wondering where to buy 10 strawberry street black triangle porcelain dinnerware, we have a large selection of 10 strawberry street black triangle porcelain dinnerware for sale at the lowest prices.